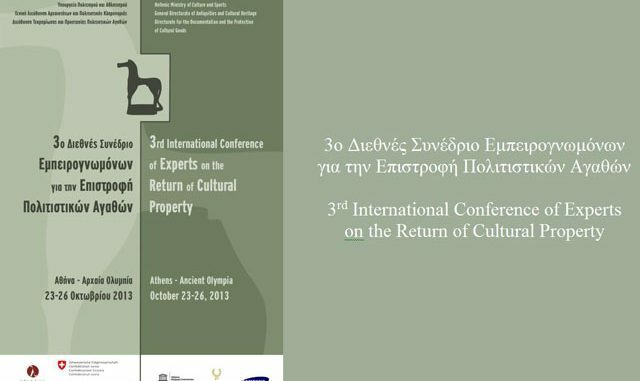 The 3rd International Conference on the Return of Cultural Property, Athens and Ancient Olympia, Greece, 23-26 Oct., 2013. Preface: The Ancient Olympia Recommendation (2013) was adopted by the 3rd International Conference of Experts on the Return of Cultural Property, Athens and Ancient Olympia, Greece, 23-26 Oct., 2013. The Conference, which was organized by the General Secretary of Culture of the Hellenic Ministry of Education and Religious Affairs, Culture and Sports, is held as a follow-up to the Second International Conference of Experts on the Return of Cultural Property, held in Seoul, Republic of Korea, 16-17 October 2012. The Conference held from Wednesday 23 until Saturday 26 October 2013. The opening ceremony, as well as the procedures of the first day accommodated in the auditorium of the Acropolis Museum, while the rest sessions from Thursday 24 to Saturday, October 26, taken place in Ancient Olympia (SPAP Conference Center). The conference gathered many invited speakers from 18 different countries and international organizations such as UNESCO and INTERPOL. They are scientists, university professors and representatives from governments and organizations with recognized validity, years of experience and plenty of relevant publications to their credit, regarding the themes of the Conference. Moreover, the first day at the Acropolis Museum, there were special lectures, which presented the positions of the Greek side and of those who advocate the return of the Parthenon Marbles to Greece. The Elgin Marbles, also known pars pro toto as the Parthenon Marbles, are a collection of Classical Greek marble sculptures made under the supervision of the architect and sculptor Phidias and his assistants. They were originally part of the temple of the Parthenon and other buildings on the Acropolis of Athens. After gaining its independence from the Ottoman Empire, Greece began a series of projects to restore its monuments, and has expressed its disapproval of Elgin’s removal of the Marbles from the Acropolis and the Parthenon, which is regarded as one of the world’s greatest cultural monuments. Greece disputes the subsequent purchase of the Marbles by the British Government and urges the return of the marbles to Greece for their unification. 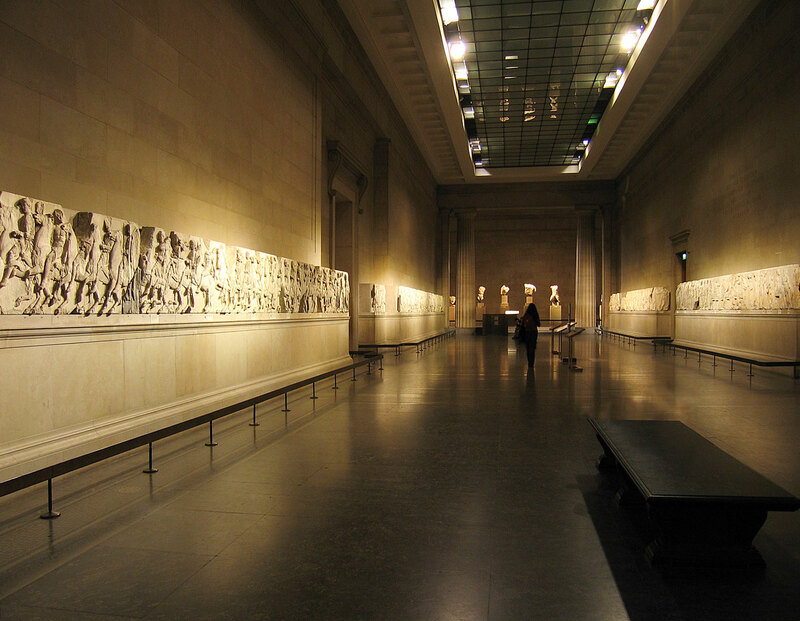 In 2014, UNESCO offered to mediate between Greece and the United Kingdom in resolving the dispute of the Elgin Marbles, although this was later turned down by the British Museum as UNESCO works with government bodies, not trustees of museums. The States, Parties or not to the 1970 UNESCO Convention on the Means of Prohibiting and Preventing the Illicit Import, Export and Transfer of Ownership of Cultural Property may utilize for appropriate intervention the Intergovernmental Committee for Promoting the Return of Cultural Property to Its Countries of Origin or Its Restitution in Case of Illicit Appropriation created in 1978. Within the framework of strategies designed and implemented to facilitate the work of the Committee and to enhance the process of restitution of cultural objects, particularly in the context of dispute resolution linked to cultural heritage, UNESCO’s General Conference adopted at its 33rd session a resolution that explicitly articulates the mediatory and conciliatory functions of the Committee. With the approval of the General Conference to modify the Committee Statute, a subcommittee was created and tasked with discussion of a draft text. At its 16th session in September 2010, the Committee reviewed and adopted the resultant Rules of Procedure for Mediation and Conciliation. Only UNESCO Member States and Associate Members may defer to the elaborated procedures for mediation and conciliation, but States may represent the interests of public or private institutions located in their territories, as well as those of their nationals. Every two years, each State is invited to nominate and submit to the Secretariat the names of two individuals who may serve as mediators and conciliators. Their qualification is contingent on their competency and mastery in matters of restitution, resolution dispute and other specific characteristics of the protection of cultural property. The Rules of Procedure are conceived under the general principles of equity, impartiality and good faith, which are intended to promote harmonious and fair resolution for disputes concerning the restitution of cultural property. As such, the text provides for confidential communication in relevant political, diplomatic, juridical and financial matters between the mediators and conciliators and each party. The Rules of Procedure for Mediation and Conciliation are meant to be complementary to the work of the Intergovernmental Committee. Moreover, their provisions may not interfere, slow, prevent or otherwise threaten other procedural and legislative means. It is noted that the text adopted by the Intergovernmental Committee represents a legal tool that does not constitute a binding normative obligation. 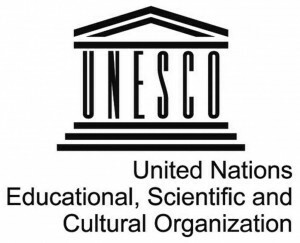 UNESCO is concerned with the issue of Return or Restitution of Cultural Property to the Country of Origin. The United Nations General Assembly is also involved in this field. Indeed, since 1972, many resolutions on the Protection and the Return of Cultural Property, as part of the Preservation and Further Development of Cultural Values, have been adopted. The 3rd International Conference of Experts on the Return of Cultural Property, Athens and Ancient Olympia, Greece, 23-26 Oct., 2013. The Recommendation recalled the UN General Assembly Resolution A/RES/67/L.34 on the Return and Restitution of cultural property adopted on 5 December 2012, the UNESCO Rules of Procedure on Mediation and Conciliation adopted by the ICPRCP, and the UNESCO’s and ICOM’S Codes of Ethics. It recommended that States become parties to the relevant international instruments, in particular the 1970 UNESCO Convention and 1995 UNIDROIT Convention, if they have not already done so. It encouraged that States could seek equitable solutions to return cultural objects to original counties governed by international legal instruments and the existing alternative means of dispute resolution available. UNIDROIT is an independent intergovernmental organisation with its headquarters in the Villa Aldobrandini in Rome. Its purpose is to study needs and methods for modernizing, harmonising and coordinating private and, in particular, commercial law between States and groups of States. To take international cooperation, UNIDROIT was asked by UNESCO to develop the Convention on Stolen or Illegally Exported Cultural Objects (1995), as a complementary instrument to the 1970 Convention. States commit to a uniform treatment for restitution of stolen or illegally exported cultural objects and allow restitution claims to be processed directly through national courts. Moreover the UNIDROIT Convention covers all stolen cultural objects, not just inventoried and declared ones and stipulates that all cultural property must be returned.